The construction of new homes has stalled, as developers wait for the record number of apartments due to come onto the market this year to clear. Building activity is levelling out to more sustainable amounts. The construction of new homes has stalled, as developers wait to clear the record number of apartments due to come onto the market this year. Yesterday's data from the Australian Bureau of Statistics shows that building activity in Australia peaked in 2016, and has been in decline this year. “Building activity has declined to levels last experienced in the middle of 2014, before the record peak in March 2016," said HIA’s principal economist, Tim Reardon. The slowdown has been most marked on the east coast, said Reardon. “At the core of this drop in activity is primarily the slow-down in construction of new apartments and units, particularly on the east coast. A record number of apartments are due to come onto the market this year, and the next phase of investment is now not likely to occur until the apartments currently under construction clear the market," he said. Construction of detached low-rise homes fell 7.7 per cent during the March quarter, reflecting declines across all states and territories. “It’s important to recognise that the downward trend is not cause for alarm," said Reardon. "We are coming down off the back of record levels of activity in recent years, particularly in apartments." The HIA expect construction activity will return to growth before the end of the decade. Western Australia (4.1 per cent) and Tasmania (12.3 per cent) were the only states to record an increase in building activity. A sharp drop in apartment construction in Sydney dragged down overall activity in NSW by -17 per cent. South Australia experienced an 11.1 per cent decline, Queensland down -10.2 per cent also due to a decline in unit construction. Victoria construction dropped by just -1.9 per cent. 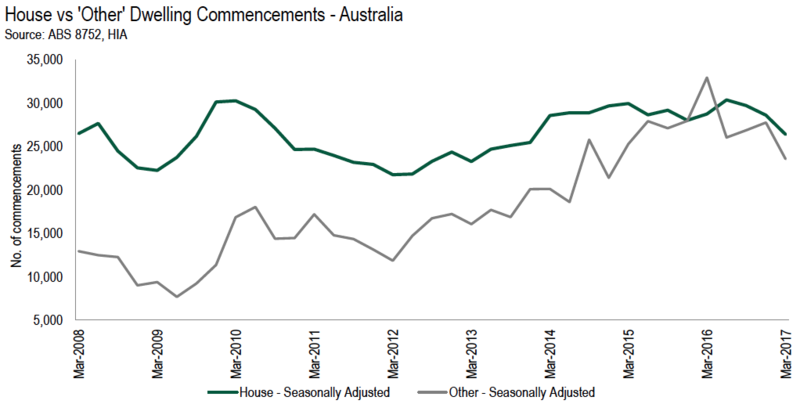 Commencements in both the ACT (-65.8 per cent) and the Northern Territory (-43.4 per cent) declined dramatically. The ABS Building Activity data is available here.